As a black hole spins, it can produce a tightly-wound column of material, or jet, blasting away from it. Cygnus A is a galaxy in the middle of a galaxy cluster that has such a jet shooting away from a supermassive black hole at its center. 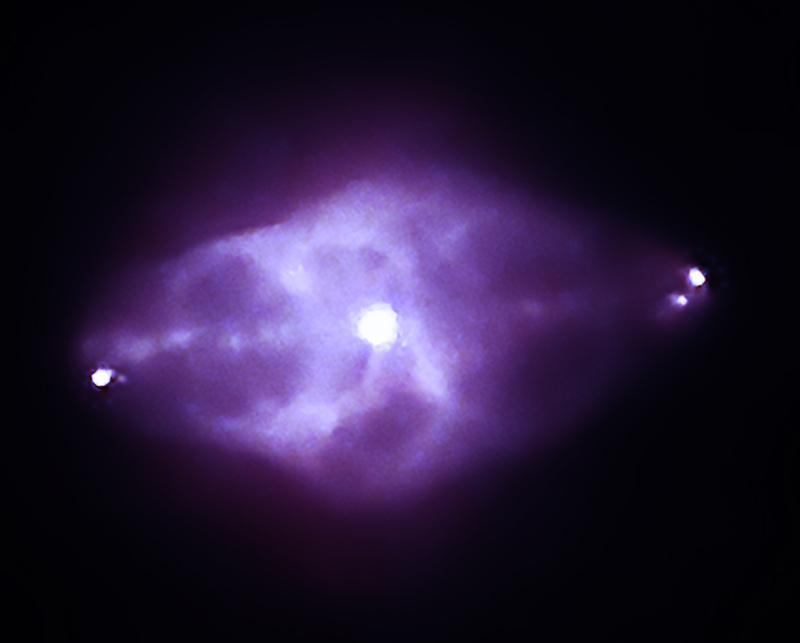 Data from Chandra reveal this jet has bounced off a wall of hot gas, then punched a hole in a cloud of particles. By studying jets like these, astronomers can learn more about how black holes influence their surroundings. A ricocheting jet blasting from a giant black hole has been captured by NASA's Chandra X-ray Observatory, as reported in our latest press release. 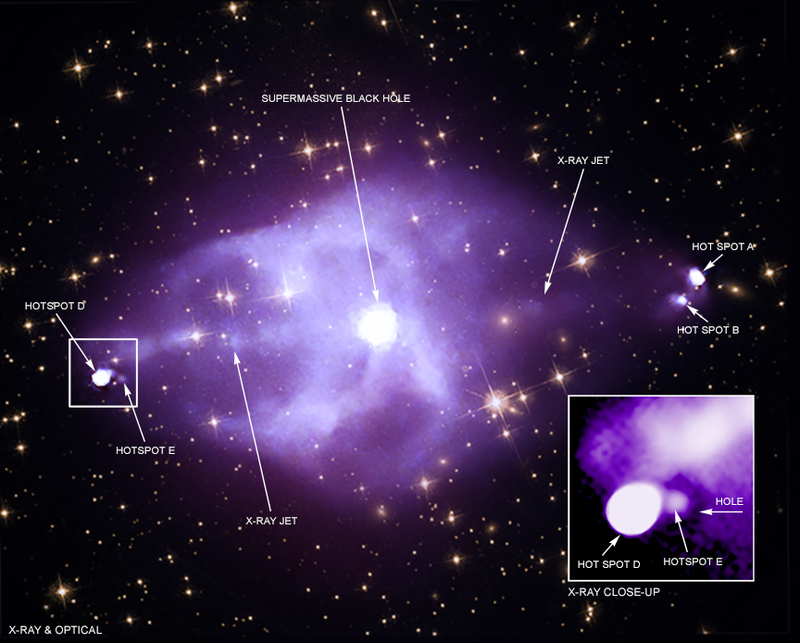 In this composite image of Cygnus A, X-rays from Chandra (red, green, and blue that represent low, medium and high energy X-rays) are combined with an optical view from the Hubble Space Telescope of the galaxies and stars in the same field of view. Chandra's data reveal the presence of powerful jets of particles and electromagnetic energy that have shot out from the black hole. The jet on the left has slammed into a wall of hot gas, then ricocheted to punch a hole in a cloud of energetic particles, before it collides with another part of the gas wall. A labeled version outlines the key features described above. 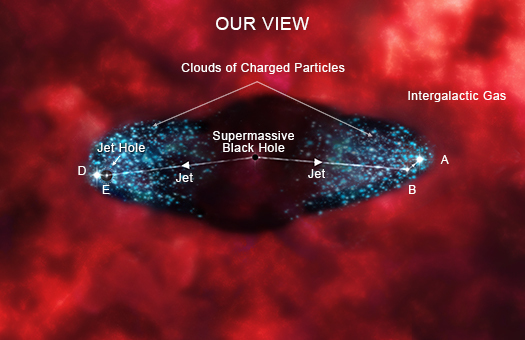 The main figure shows the location of the supermassive black hole, the jets, the point that the jet on the left ricocheted off a wall of intergalactic gas ("hotspot E"), and the point where the jet then struck the intergalactic gas a second time ("hotspot D"). The inset contains a close-up view of the hotspots on the left and the hole punched by the rebounding jet, which surrounds hotspot E. The image in the inset combines X-rays from all three energy ranges to give the greatest sensitivity to show fine structures such as the hole. Cygnus A is a large galaxy that sits in the middle of a cluster of galaxies about 760 million light years from Earth. A supermassive black hole at the center of Cygnus A is rapidly growing as it pulls material swirling around it into its gravitational grasp. During this process, some of this material is redirected away from the black hole in the form of narrow beams, or jets. Such jets can significantly affect how the galaxy and its surroundings evolve. 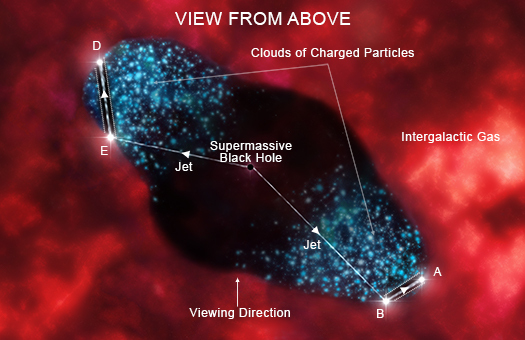 In a deep observation that lasted 23 days, scientists used Chandra to create a highly detailed map of both the jets and the intergalactic gas, which they used to track the path of the jets from the black hole. The jet on the left expanded after ricocheting and created a hole in the surrounding cloud of particles that is between 50,000 and 100,000 light years deep and only 26,000 light years wide. For context, the Earth is located about 26,000 light years away from the center of the Milky Way galaxy. The scientists are working to determine what forms of energy — kinetic energy, heat or radiation — the jet carries. The composition of the jet and the types of energy determine how the jet behaves when it ricochets, such as the size of the hole it creates. Theoretical models of the jet and its interactions with surrounding gas are needed to make conclusions about the jet's properties. Energy produced by jets from black holes can heat intergalactic gas in galaxy clusters and prevent it from cooling and forming large numbers of stars in a central galaxy like Cygnus A. Thus, studying Cygnus A can tell scientists more about how jets from black holes interact with their surroundings. These results were presented at the 233rd meeting of the American Astronomical Society meeting in Seattle, WA, in a study led by Amalya Johnson of Columbia University in New York. NASA's Marshall Space Flight Center in Huntsville, Alabama, manages the Chandra program for NASA's Science Mission Directorate in Washington. The Smithsonian Astrophysical Observatory in Cambridge, Massachusetts, controls Chandra's science and flight operations. A ricocheting jet blasting from a giant black hole. About 760 million light years from Earth. About 540,000 light years across.